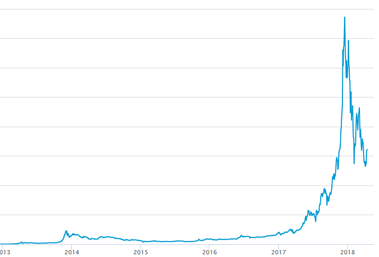 Bitcoin made the headlines last year, when it shot up in value from $998 at the beginning of 2017 to a phenomenal $19,666 in December 2017. It then fell again, partly due to a ban by China and several hacks, and is currently trading at around $6600. Nevertheless, bitcoin has entered the public consciousness as a potential alternative currency. Bitcoin experienced a massive surge in value at the end of 2017. Chart: CC BY-SA 4.0. Bitcoin is a digital currency: it is not tied to any tangible asset, such as banknotes or gold. Bitcoin users trade in digital tokens, that is, encrypted files that live on computers. What's more, bitcoin operates without any kind of central bank that checks and records transactions. At first, the idea is puzzling. If there isn't a central bank that issues the currency, then where do new bitcoins come from? And since it's presumable easy to copy a digital token, after all it's just a file, how do you stop users from duplicating their tokens and spending the same bitcoin more than once? Bitcoin has an elegant answer to both these problems. The services of a central bank, such as validating and recording transactions, are performed by users of the currency. As a reward these users receive new bitcoins that are generated according to a fixed mathematical formula. Performing banking services to receive bitcoins is a bit like mining the ground for gold, which is why users who volunteer to do this are known as miners. 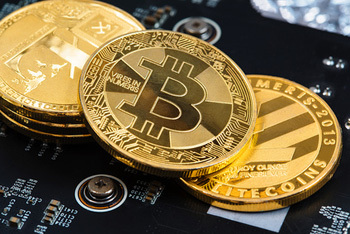 The first bitcoins where mined in January 2009 by the mysterious person, or group of people, who developed bitcoin, known as Sakoshi Nakamoto. The first person to receive bitcoins (ten of them) was the cypherpunk Hal Finney on January 12, 2009. In 2010 programmer Laszlo Hanyecz bought two pizzas for 10,000 bitcoin in what is believed to be the first commercial bitcoin transaction. Once an amount of bitcoins is in circulation and there are users to check transactions and mine for new coins, the system can roll on of its own accord — at least that's the idea. Underneath it, stopping the system from descending into chaos and fraud, is a structure for storing data called a blockchain. Because blockchains can potentially be used, not just in cryptocurrencies such as bitcoin, but in all sorts of other contexts, they are the focus of a lot of attention in the tech world. Blockchain was also a hot topic at this year's Heidelberg Laureate Forum (HLF), which allows young researchers to meet the best minds of mathematics and computer science to pave the way for future research. At the HLF we met Silvio Micali, Ford Professor of Engineering and Computer Science at MIT, who took upon him the daunting task of explaining how blockchain works (you can also watch a video of some of the interview at the end of this article). "In cryptocurrency the idea is not to trust [a central authority], but to spread the trust over many, many entities, ideally everybody who is part of the system," says Micali. To achieve this, the record of valid bitcoin transactions, which would normally be held privately by a central authority, is public and maintained by all the users of the bitcoin currency. Anybody who wants to make a transaction broadcasts their intention to the network of bitcoin users. Other users (miners) will check the transaction is valid, for example making sure the bitcoins in question haven't been spent before, and then append the valid transaction to the record. If the record were just a very long list, then it could of course be tampered with: if you wish you hadn't spent all those bitcoins on a new dress, you simply go back and erase the payment. This is why the transactions are combined into blocks. Once a block is complete it is encoded using a mathematical function called a cryptographic hash, which turns the block into a string of 0s and 1s according to a mathematical recipe. This code, the block's "fingerprint", is then included in the next block that comes along, which, when complete, will also be encoded and have its fingerprint included in the following block, and so on. In this way, every block carries the fingerprints of all the blocks that came before it in the chain. "The data base is secure in the sense that a change in one block causes changes in the next block, and the one after that, etc, so you can see if someone has tampered with it," says Micali. The only way to alter a block without detection would be to change it in a way that leaves the block's fingerprint unchanged. And this, by the design of the cryptographic hash function, is practically impossible. The order of blocks also can't be changed without detection. "[Blockchain] is a way to freeze, at every point in time, a data base that keeps on going and going," says Micali. An obvious question, however, is this: without a central authority to orchestrate the block chain, who decides which transactions go into the next block? Bitcoin uses a competitive system called proof of work. If you're a miner, you are constantly listening out for new transactions waiting to be validated. Once you have checked sufficiently many, you come up with a candidate block of new transactions. However, the system will immediately generate a hard maths problem uniquely connected to your block. It'll do the same for every other user proposing a block, and although all the problems are different, they are of comparable difficulty. The user whose computer cracks its problem first gets to propose the next block along, and earn Bitcoins as a reward. And since all previous transactions are common knowledge, a block containing fraudulent transactions can be detected and rejected by the other users. At the moment bitcoin generates a new block roughly every ten minutes. As it stands, blockchain as used by bitcoin isn't free of problems. Some people simply reject the idea that a decentralised currency devoid of context could actually work. Micali points to a more practical problem: the fact that the system for generating new blocks through a problem solving competition costs a lot of computing power. "You can think of as having an equation that is uniquely tied to a block," says Micali. "I want to solve it. so I plug in random values for the variables and see if the equation is solved. It is a very expensive process, so if I have [many] computers I have a big edge over everybody else in solving the [problem associated to a block]. So I need to have a lot of capital to have a voice in the system." "Right now in systems [using proof of work] blocks can only be proposed by relatively few individuals. These individuals have consolidated into pools of miners. We are now at a point where, in bitcoin, block proposing is concentrated in the hands of three pools." This doesn't only contravene the philosophy of decentralisation, but also opens the door to fraud. If a single entity controls more than 50% of the computing power used to propose blocks, then it could in theory include fraudulent transactions in the blocks, or spend bitcoins twice. Another problem with proof of work is that it's expensive in terms of energy. "The farms of computers that are trying to solve the [problems associated to blocks] now consume more electricity than the country of Switzerland by a margin of over 20%," says Micali. "As people join the race to solve [these problems] it's going to be more expensive." This cost, so Micali, will eventually come back to the users, in the shape of inflation or transaction fees. Current bitcoin transaction fees are less than $0.1, but in the past they have peaked at $34 — not what you want to pay if you're only buying a meal in a restaurant. The race is currently on to find other systems for proposing blocks in the blockchain. "The idea is to look at the money that all users have," he says. "And to orchestrate the system so that if the majority of the money is in honest hands then the system works and there is no need to punish anybody because you make it impossible to cheat." Micali has developed his own system for choosing blocks, called Algorand. It works by randomly selecting a single user to propose the new block, with the probability of a user being selected proportional to the amount of money they have in the system, and then randomly selecting a collection of verifiers, with probabilities also in proportion to the amount of money those users own, to agree on the block the first user has chosen (find out more here). What method is best remains to be seen. It also remains to be seen whether the blockchain itself, whatever context it is used in will turn out to be a good idea — some people query the fact that blockchain and cryptocurrencies, despite having been around fora good few years, haven't really taken off as yet. But Micali urges patience. "For thousands of years we either walked or went on horse back," says Micali. "Then we had some puffing machines you risked your life getting into, then we had locomotives and eventually planes. I think that with blockchains and cryptocurrencies that's what's happening. We started with simple technology that vaguely addressed the goal of decentralisation, but for poor design ended up being centralised. But we're going to see better and better technologies so that we are going to realise the dreams people have about cryptocurrencies." Marianne Freiberger is editor of Plus. 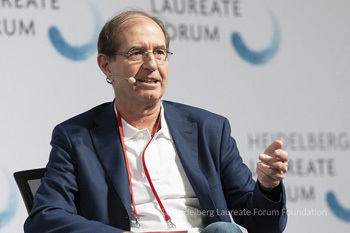 She interviewed Silvio Micali in September 2018 at the Heidelberg Laureate Forum 2018.